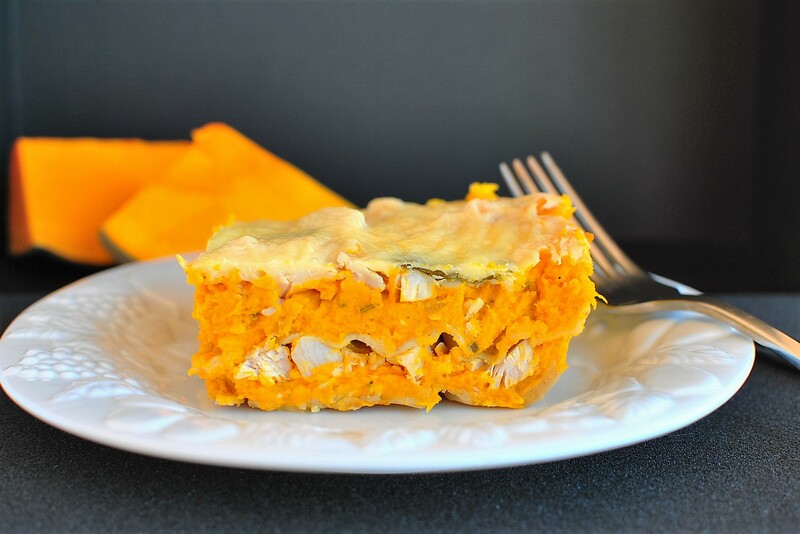 This recipe incorporates three ingredients I really like and eat a lot of, chicken, pumpkin and nutritious leafy greens, which make this chicken & pumpkin lasagne a firm favourite in my eyes. Furthermore if you plan ahead when cooking a roast chicken you can do a lot of the prep work at the same time just roast pumpkin, onions and garlic with the chicken and use the left over chicken meat in your lasagne the next night. Pumpkin is one of my favourite vegetables, it is not only delicious, but is so versatile and I use in in many recipes such as pumpkin spice donuts, roasted pumpkin soup or this delicious quinoa salad. I really don’t think there is a dish that doesn’t taste great with the addition of pumpkin from savoury to sweet they all taste yummy!! As you can tell I love pumpkin and plant as many as I can in my garden every year, but love coming up with different ways to use them, rather than everything tasting the same. This recipe is great the next day if you need to make ahead or just want leftovers for a quick meal. If you want to have a vegetarian option, just omit the chicken, it will not change the flavour too much. I generally roast my pumpkin for this recipe, but you can also just boil or microwave it and then sauté the onion and garlic. Delicious chicken & pumpkin lasagne with healthy super greens make this fall favourite not only comfort food at it's best, but nutritious too. Add all herbs and spices, cream, milk, 1/2 cup of parmesan cheese, and cottage cheese and mix until thoroughly combined. Pour 1 tablespoon of milk into an 8-by-12-inch baking dish. Top the milk with one third of the pasta sheets, then spread half the pumpkin mixture over the pasta. Layer half of the greens and chicken over the pumpkin mixture. No Replies to "Chicken & Pumpkin Lasagne"